Children with acute onset non-traumatic limp often present to emergency departments (EDs). The limp can be associated with medical emergencies such as septic arthritis and slipped upper femoral epiphysis but is often due to less severe conditions. This article discusses the common and self-limiting causes of acute onset of non-traumatic limp in children, such as transient synovitis, reactive arthritis, and benign acute childhood myositis. It also discusses more severe conditions, including septic arthritis, osteomyelitis, slipped upper femoral epiphysis, Perthes disease, malignancies and non-accidental injury. Management and prognosis of these conditions are discussed in the context of guidance from the National Institute for Health and Care Excellence. 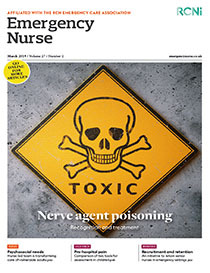 The article includes two case studies that illustrate different presentations and the challenges that nurses who manage children in EDs are likely to come across in clinical practice.